Commonly suits receipt printing scales, label printing scales or cash register scales. Some standard cash registers may also use the 57 x 89mm Thermal Paper Roll. Has a 38mm core size. 25 Paper Rolls per box/unit quantity. Delivery Australia Wide. Suits most POS "impact" printers. These are commonly used in hospitality (Restaurant, Cafe or Fast Food) environments in food (kitchen) and or beverage (bar) printers (Kitchen Printer Paper Rolls). Some retailers use them in POS receipt printers. 50 Paper Rolls per box/unit quantity. Delivery Australia Wide. Suits most modern day POS receipt printers. The 80 x 80mm Thermal Paper Roll is by far the biggest seller! 50 Paper Rolls per box/unit quantity. Delivery Australia Wide. Coloured Thermal POS Receipt Rolls 80 x 80mm that will work in any standard thermal POS printer that uses an 80mm width thermal roll. Choose your colour: Pink, Blue or Green. 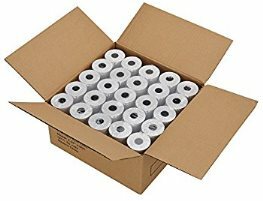 50 Paper Rolls per box/unit quantity. Delivery Australia Wide. Standard type of paper eg. drawing or copy paper. The image on the top copy is achieved by a ink cassette / ribbon that feeds through the "impact" printer mechanism. Single Ply Paper Rolls are primarily used in cash registers, except for the 76 x 76mm paper rolls which are used in POS "impact" printers. Primarily used as 2-ply (duplicate) paper rolls although 3-ply (triplicate) paper rolls are available. The paper is coated with micro capsules that create a duplicate image on the second (and third) layer of the paper roll. The image on the top copy is achieved by a ink cassette / ribbon that feeds through the "impact" printer mechanism. The two and three ply paper rolls are commonly used in hospitality establishments in food and beverage order printers. The 2-ply paper usually comes as white / yellow while the 3-ply comes as white / yellow / pink. Thermal Paper is coated with a heat sensitive coating which reacts with the heated print head in the printer mechanism. You do not need to use any ink cassettes / ribbons within a thermal printer. To identify thermal paper, simply run your finger nail across the surface and the heat generated by the friction will cause a black line. Thermal paper also has a very smooth surface feel. Many other styles and sizes not listed below are available upon request. Paper Rolls are typically boxed in quantities of 50. Delivery is available Australia wide.